You are now reading "Overview of Original Subscription Model and..."
Dr. Peter Bach, Senator Bill Cassidy (R-LA), and Mark Trusheim put forward an alternative funding mechanism for prescription drugs in an article published in the Journal of the American Medical Association. The subscription-based payment model is proposed to offer an unlimited amount of medications over a predetermined period of time specified in a multi-year contract with a state coalition of payers paying a flat annual subscription fee. 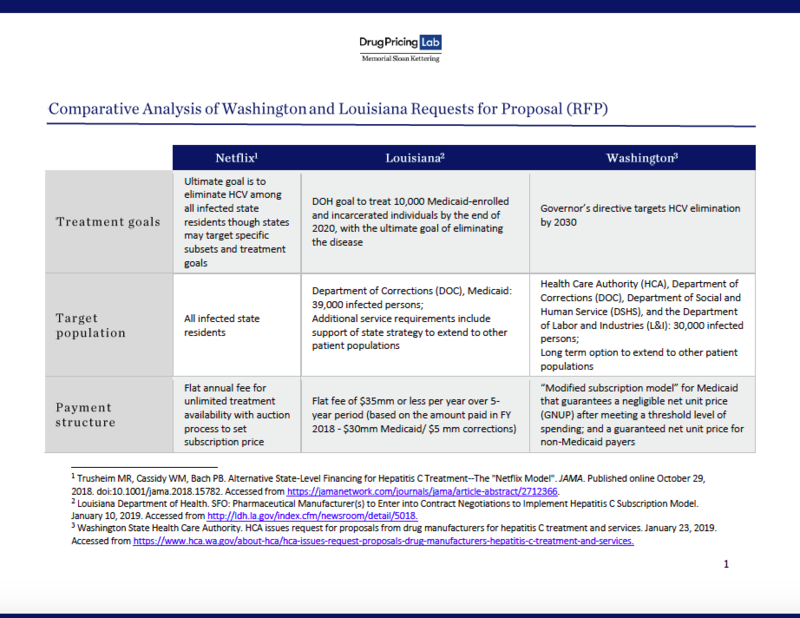 On January 10, 2019, officials in the state of Louisiana announced plans to proceed with a subscription-based payment model for providing hepatitis C treatment and have published a solicitation for offers to manufacturers to enter into negotiations. Additionally, Washington state released a request for proposals for a “modified subscription model” for treating HCV on January 22. Here we present an overview of the original subscription-based Netflix model proposed and the proposals put forth by Louisiana and Washington.